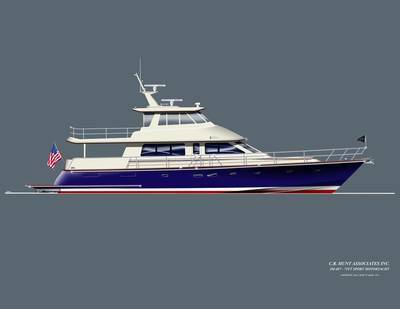 Hunt Yachts LLC announced plans to build its largest model yet: the Hunt 80' Sport Motoryacht. 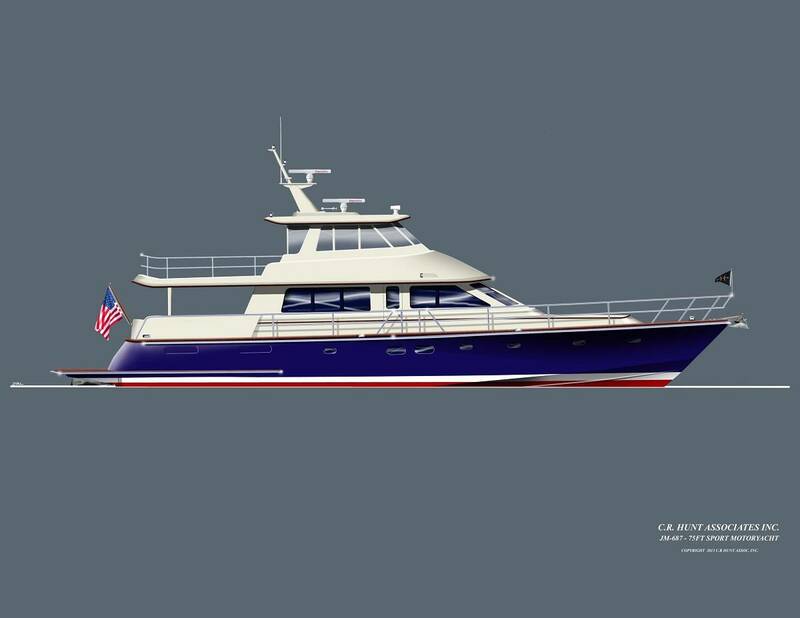 According to the Rhode-Island based designer and builder, an experienced yachtsman who also owns a Hunt Harrier 25’ has commissioned this new 80’ Hunt flagship. The 80'Sport Motoryacht features a hull and superstructure designed by C. Raymond Hunt Associates, whose founder, Ray Hunt, invented the deep-V hull. 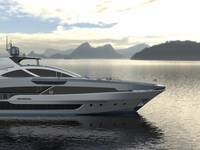 Powered by twin 1,600-bhp diesels mated to Hamilton water-jet drives, the new 80’ is projected to have a top speed in excess of 31 knots – combined with a draft of just 4 feet and is due to launch in the summer of 2015. The new Hunt 80’ is based on a hull design that C. Raymond Hunt Associates conceived as a platform for a variety of yachts in the 63- to 82-foot size range. Its deep-V configuration and moderate beam enable it to slip easily through the water, enhancing the vessel’s speed and seakindliness in rough offshore conditions. 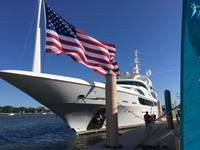 This platform made its debut with the Hunt 68’ Motoryacht, an offshore cruiser with attractive lines and outstanding performance. In the 80’ Sport Motoryacht, the design firm has maintained those attributes while greatly expanding the living and entertaining spaces and adding a fully enclosed raised command flybridge. 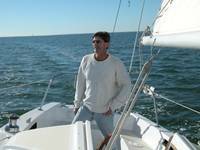 The owner decided to build a bigger Hunt after experiencing the craftsmanship, handling and performance of his 2013 Harrier 25’, which Hunt Yachts personalized for him with an extensive teak trim package and other options. The owner worked intensively Peter Boyce and Winn Willard, the design team, and Hunt Yachts over a six-month period on the design of his highly customized new project. What started out as a 75-foot motoryacht quickly morphed into an 80-footer due to the owner’s desire for more open-air space on the flybridge and main decks. The tender was moved down to the extended swim platform in order to keep the after portion of the flybridge clear for use as a sundeck. He also specified that the vessel’s draft be 4 feet so he could use it in the shallow waters of Florida and the Bahamas. “I said, in that case we’ve got to go with water jets,” Willard recalled. While Hunt offers a wide range of propulsion options for its yacht models, it is highly experienced in designing and building water-jet vessels. “The Hamilton 651s are big and efficient. The 80’ won’t need bow thrusters or stern thrusters – it will do it all by itself,” Willard said. The Hunt 80’ Sport Motoryacht series features a three-stateroom layout with a full-beam master suite amidships, plus a fourth, “bonus” bunkroom that can accommodate a child, a nanny or another member of the owner’s staff. The lower deck layout also includes a separate crew quarters aft with a double stateroom for the captain and a bunk for another crewmember. The main deck encompasses a large galley, dining area, and main saloon opening onto a large open-air aft deck sheltered by the flybridge overhang.